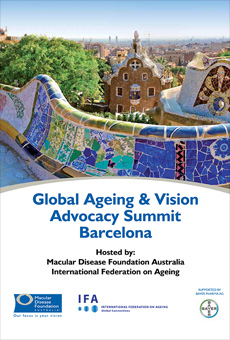 Macular Disease Foundation Australia and the International Federation on Ageing co-hosted the inaugural Global Ageing & Vision Advocacy Summit, with leading international advocates from 12 countries in Barcelona, Spain, on 17–18 April 2013. Macular Disease Foundation Australia’s Chief Executive Officer Julie Heraghty, and other leading advocates presented their work on ageing and vision, exploring linkages and commonalities. The summit provided a platform, through the exchange of learning and knowledge, to build the capability and capacity of the ageing and vision sectors to effectively advocate and represent the interests of citizens at risk of vision impairment. Download the Summit report below.